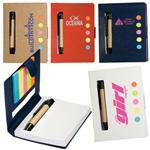 Custom Jotters are great for trade show giveaways. 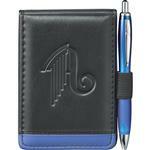 The Windsor Reflections Jotter has been a best seller among all of our promotional products. Soft, padded stitched construction. 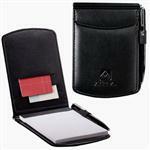 Pockets for business cards. Fits most jacket or shirt pockets. 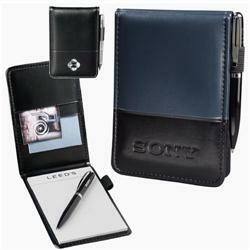 Includes 3" x 4.75" writing pad. Pen cost is additional, ask our staff for options! FREE 1-DAY RUSH PRODUCTION AVAILABLE! Available Colors: Solid Black and Blue with Black. Dimensions: H 5" x W 0.5" x L 3.5". Spine Top Centered on bottom panel L 2" x H 1.13". Spine Top Centered on top panel L 2" x H 1.5". Available Imprint Options: Color Print or Bline Deboss. Materials: Ultrabond. Jotter. Tradeshow Giveaway. Carton size H 9.84" x W 14.37" x L 22.83". Carton pack 96 pieces, Carton weight 29.32 lbs.